Andy was back for the holiday, and I knew this would be the place to take him, since he has never been known to say no to pizza or gnocchi. We began the meal with a small serving of marinated olives. They turned out to be the only unexceptional course we ate that night, with one of the three different varieties being too salty and another bitter. Andy ordered the gnocchi (pictured above), which were made with ricotta rather than tomatoes, and simmered in brodo (broth) rather than a traditional red or cream sauce. The brodo was flavored with radicchio, red onions, pancetta and black pepper. “This is the best gnocchi I’ve ever had,” he stated at the table. I tasted it, and he was right. The gnocchi had taken on the smoky flavors of the broth to add even more dimension and depth to the dish. He claimed that he’d never had such a velvety texture. While Andy was inhaling his handmade gnocchi, I was once again reveling in the amazingness of the maccaronara pasta that I’d had last time. (To see a picture of the fresh pasta, click here.) 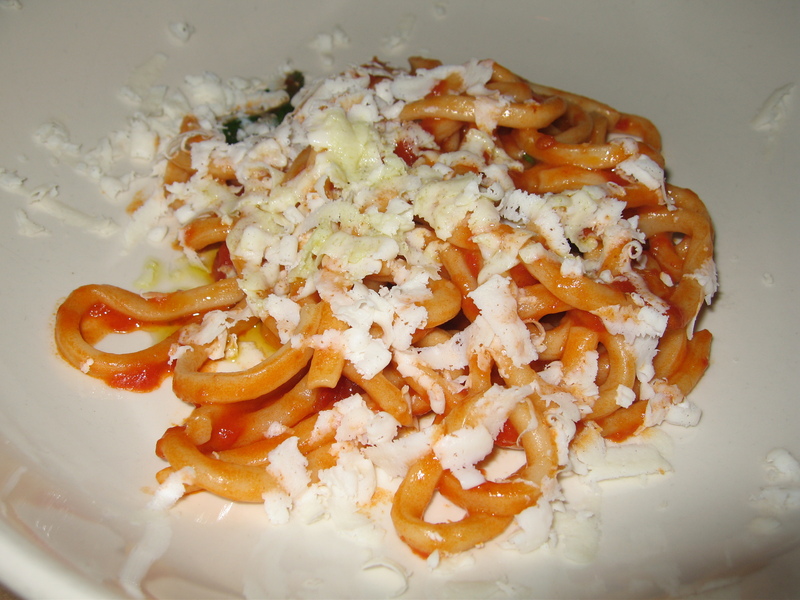 It was everything it had been the first time — chewy, sweet, earthy, tangy tomato sauce with lots of toothsome chewiness. To continue on our shameless carbo-loading fest, Andy and I proceeded to order the margherita pizza, A16’s claim to fame. A16 alleges that they have one of only three chefs in America officially licensed to make pizza in the style of Naples, Italy. 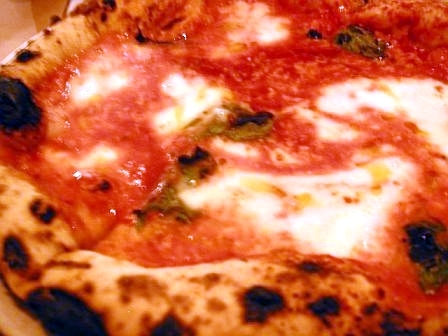 The margherita pizza was so wet that I could not keep it together using both of my hands. Rather, I had to fold all of the sides in so that the crushed tomatoes and the drippy inner crust would not entirely fall apart. (Can’t you tell by the picture above?) That being said, the taste of the pizza made up for its messiness: The crushed tomatoes were bright and flavorful, and the cheese was a perfect mellow contrast to the sauce. The crisp but soft edges were dotted with charred patches from the wood-burning oven. In my experience, I have found A16’s dishes to be far more consistent (and better) than other popular Italian restaurants, such as Delfina and Perbacco (in a recent trip here, I concluded that A16’s handmade pastas are superior). As I’ve mentioned before, Italian pastas can be difficult to butcher, yet they rarely impress me, either. A16 has already made it on my list of twenty favorites around SF, but I have to say that now it has become a contender in my mind for best restaurant of the year, as I can’t stop thinking of excuses to go there again for a guaranteed outstanding meal. This entry was posted on January 24, 2008 at 5:00 am and is filed under pizza, Recipes, Restaurants with tags favorites, Italian, pizza. You can follow any responses to this entry through the RSS 2.0 feed. You can leave a response, or trackback from your own site. Ah, gnocchi. It is really hard to beat good Italian food, in my carb-loving mind. There is a place in Boise that makes a divine pumpkin gnocchi with olive oil and lingonberries – the gnocchi are slightly crispy on the outside and soft on the inside, and the lingonberries make the dish sweet and tart. if i had to pick one meal to eat every day for the rest of my life, it would be gnocchi. have you had the spinach gnocchi at casanova in carmel yet? it’s not made with potatoes…but it’s amazing. One of three? There are several D.O.C. pizzerias in this country these days, and I don’t think A16 were one the first. Here’s an article explaining the certifying process: http://italiancuisine.suite101.com/article.cfm/in_search_of_true_italian_pizza . The place mentioned in the article, 2Amys, was one of my favorite restaurants back in DC. I’d love to try A16, but I also highly recommend Pizzaiolo in Oakland. Much better than Delfina.